Jemima has been dancing at the school since the age of three. 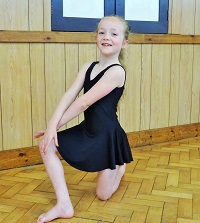 Jemima attends four dance classes a week which include tap, ballet and modern. Jemima has won this award for her hard work in class and progress throughout the year. Jemima is always practising her dances and is very good at encouraging other members of her group and helping out. Jemima competes in festivals and competitons and has gained 1st, 2nd and 3rd placings in her dances. Holli has been dancing at the school for a number of years. Her work ethic is excellent in class and she always strives to give 100% in all her classes. Holli attends a number of dance classes throughout the week which include Tap, Ballet and Modern. Her commitment is excellent and Holli always gives an outstanding performance whether in class or on the stage.